Since 1984, the Friends of the South Burlington Public Library have been active in revitalizing Library programs, Library materials and the Library space through their membership contributions, volunteer work, and fundraising projects.The Friends are concerned citizens who believe a dynamic library is the cornerstone of an educated, caring, and stimulating community environment and support the mission, programs, events, and staff of the South Burlington Public Library through fundraising, volunteerism, and advocacy. Participation is optional … you can simply make a tax deductible donation, though we would gladly welcome your help the book sales, book shop, and other activities. Please consider becoming a Friend today! Click here to join. 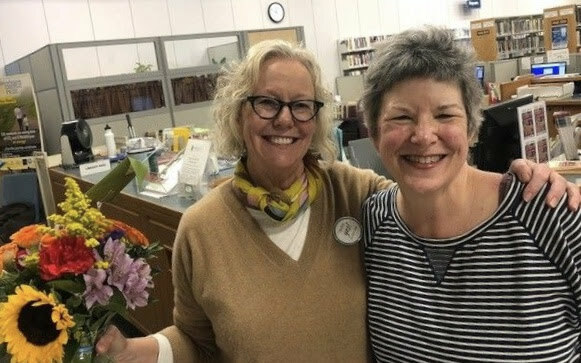 Membership in the Friends of the Library enables you to help your Library thrive, demonstrate your enthusiasm for books and learning, meet other Library enthusiasts who share common interests and attend the special Friends social even. If you are interested in becoming a member of the Friends click here. The Friends of the South Burlington Public Library is a 501 (c)(3) non-profit organization and membership contributions are fully deductible as allowed by law. Meetings are open to the public and are held the second Monday of each month at 9 a.m. if held at the Wheeler House and at 10 am if held at the Library. Please call the Library for location. We Need Your Help: Volunteer to be an Officer! Have an aptitude for numbers? Love balancing your checkbook and making budgets? Or perhaps this sounds like someone you know? If so, please consider hearing more about the volunteer Treasurer position with the Friends. Like to keep track of details? Have a talent for quickly & accurately recording what is happening? Or perhaps this sounds like someone you know? If so, please consider hearing more about the volunteer Secretary position with the Friends. Like making phone calls? Would you like to get to know our members? Then please consider joining our Membership Committee. Like planning events and activities for your family and friends? Then please consider joining our Programs and Events Committee. Like hosting people and making sure delectable treats are available for them to sample? Then please consider joining our Hospitality Committee. Please email us at fotsbpl@gmail.com for additional information on all volunteer opportunities. A Novel Idea Bookshop has openings for two-hour volunteer shifts (10 am to 12 noon, or 12 noon to 2 pm) available Thursday, Friday and Saturday. Please email us at fotsbpl@gmail.com for additional information. We support the Library with funds raised at two annual book sales. For our upcoming book sale, we would love to have your participation! If you would like to sort books, collect the money or assist customers, please email fotsbpl@gmail.com, indicating your time shift preference. Book donations can be delivered to A Novel Idea at Wheeler House, 1100 Dorset Street, on days Bookshop is open from 10 am to 2 pm only. Closed Easter, Thanksgiving, Christmas and New Year's holidays. VHS tapes, cassette tapes, magazines, Reader's Digest books, books that are academic, in a foreign language, obscure or religious. Books more than five years old. We love books as much as you do and we want your loved books to find a good home! Please bring these older books to Goodwill, ReSource (Habitat for Humanity), RePlays, Hannaford or a local recycling center. For more information on book donations click here.